Several people have pointed out that Microsoft Robotics Developer Studio has some strikingly familiar development tools, when compared to LabVIEW. Case in point: Microsoft’s “visual programming language” and LabVIEW “graphical programming language;” both are based on a “data flow” programming paradigm. Now, both LabVIEW Robotics and MSRDS are incredibly useful robot development tools, each on its own accord. That’s why I was excited to see that LabVIEW Robotics includes a shipping example that enables users to build their code in LabVIEW and then test a robot’s behavior using the MSRDS simulator. This way, you get the best of both worlds. Basically, LabVIEW communicates with the simulated robot in the MSRDS simulation environment as though it were a real robot. As such, it continuously acquires data from the simulated sensors (in this case, a camera, a LIDAR and two bump sensors) and displays it on the front panel. The user can see the simulated robot from a birds-eye view in the Main Camera indicator (large indicator in the middle of the front panel; can you see the tiny red robot?). The user can see what is in front of the robot in the Camera on Robot indicator (top right indicator on the front panel) . And the user can see what the robot sees/interprets as obstacles in the Laser Range Finder indicator (this indicator, right below Camera on Robot, is particularly useful for debugging). On the LabVIEW block diagram, the simulated LIDAR data obtained from the MSRDS environment is processed and used to perform some simple obstacle avoidance, using a Vector Field Histogram approach. 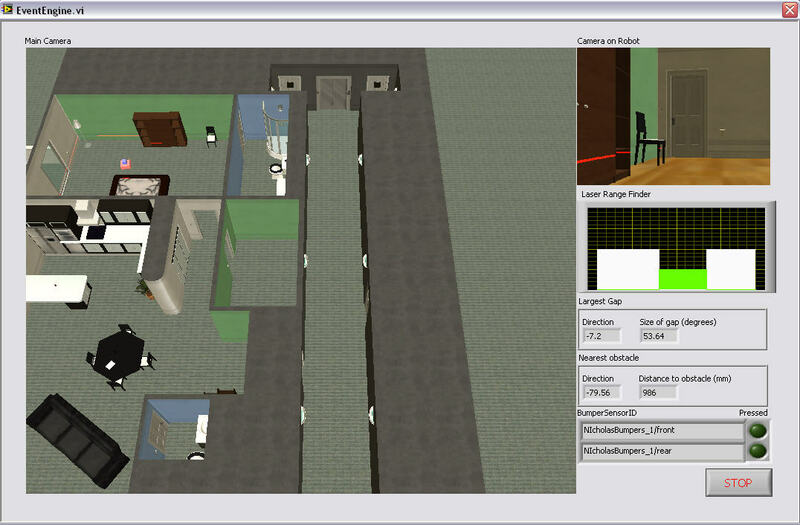 LabVIEW then sends command signals back to MSRDS to control the robot’s motors, and successfully navigates the robot throughout the simulated environment. There’s a tutorial on the LabVIEW Robotics Code Exchange that goes into more detail for the example. You can check it out here. 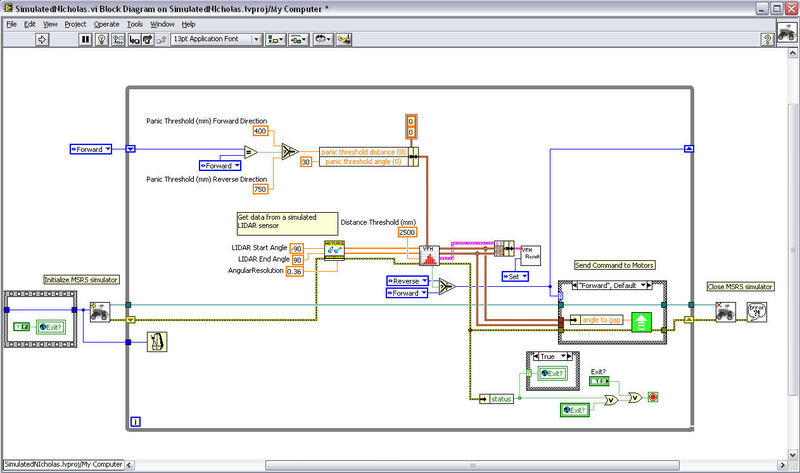 LabVIEW users can build and modify their robot control code and test it out in the MSRDS simulator. This way, regardless of whether or not you have hardware for your robot prototype, you can start building and debuging the software. But here’s the kicker: once your hardware is ready, you can take the same exact code you developed for the simulated robot and deploy it to an actual physical robot, within a matter of minutes. LabVIEW takes care of porting the code to embedded processors like ARMs, RT OS targets and FPGAs so you don’t have to. Reusing proof-of-concept code, tested and fined-tuned in the simulated environment, in the physical prototype will save the developers SO MUCH TIME. As of now, the model used in the LabVIEW example is fixed, meaning, you do not have the ability to change the physical configuration of actuators and sensors on the robot; you can only modify the behavior of the robot. Thus, you have a LIDAR, a camera, two bumper sensors and two wheels, in a differential-drive configuration, to play with. But it’s at least a good start. It’s nice to see more development tools out there, like LabVIEW and MSRDS, working together. This allows roboticists to reuse and even share their designs and code. Combining COTS technology and open design platforms is the recipe for the robotics industry to mirror what the PC industry did 30 years ago.